After an impressive turn providing the artwork to Maidus Comics’ The Incredible Bun, cartoonist Rosie Packwood takes full control here with Blinker, a fast-paced sci-fi romp from which sees gifted youngster Merrik trying to escape captivity by stealing a spaceship and getting the hell out of dodge. Merrik is assisted in this endeavour by a humorous, overly chatty computer A.I. called “Trixie”, and the back-and-forth banter between the pair during the course of the escape provides the main source of charm throughout the course of this eleven-page chapter. It’s a strong opening, and the rapid-fire pacing and sense of genuine urgency throughout goes a long way towards masking the familiarity of some of the tropes on display. Packwood’s sense of humour, both in terms of dialogue and visuals, shines through here, and while a couple of the funny moments perhaps don’t land quite as well as they should, there’s still more than enough here to keep a smile on any reader’s face. It’s maybe a little rough around the edges in places, but the sheer enthusiasm behind it – along with the impressive pacing and the charming, dynamic artwork – make this another solid addition to the Madius Comics library. Definitely a new series to keep an eye on from a new cartoonist who looks to have all the potential in the world. 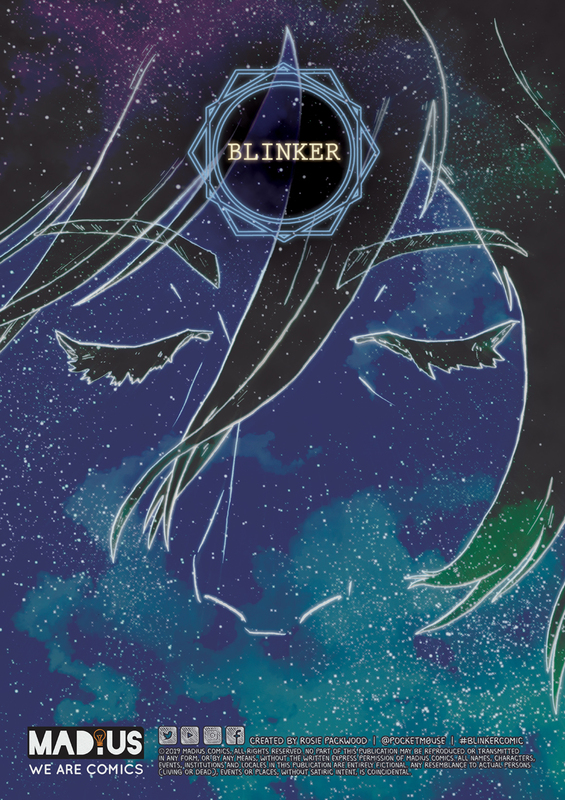 You can get yourself a copy of the first chapter of Blinker for just £1 by CLICKING HERE. The second chapter will follow later in 2019. To see updates on the progress of chapter 2 search for #blinkercomic or follow @pocketm0use on Twitter or Instagram.